Online customers click here to place an order. Online customers track your order here. 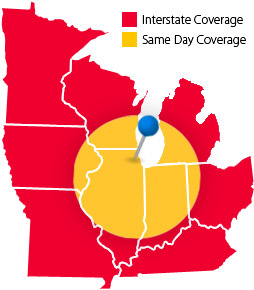 For over 37 years, Larson Express has been serving the greater Chicago / Joliet, Northwest Indiana and Southeast Wisconsin areas providing reliable & cost effective delivery services. From documents & packages to medical specimens, we have the experience to deliver it on time and on budget. Larson Express is large enough to serve all of your needs but small enough to offer personalized service. Larson Express provides regularly scheduled deliveries based on customer needs at cost-effective prices. All personnel designated to handle specimens are thoroughly trained and comply with all federal, state and local laws. For over 37 years, Larson Express has been serving the greater Chicago area providing reliable & cost effective delivery services. We have resources available to ship anywhere in the continental United States. Please enter all information and you will be contacted by a representative shortly. Our commitment to leading edge software and equipment ensures we are Delivering the Difference.